A great product manager is said to have a brain of an engineer, heart of a designer and the speech of a diplomat. The interwoven responsibilities between product management and UX make them a dynamic duo in action. They talk to customers, find out the ‘whys’, sketch ideas, test solutions, stage requirements, and so on. With their powers combined, Product and Design may create wonders. These roles have evolved over the years, especially with the boom of agile development and user experience. By entwining Product and Design together, you get the best of both worlds. So how can these two work hand in hand? Let us first understand their individual responsibilities. What we aim to impart here is that there needs to be a conjoint share of responsibilities between the two. Product Managers are more than quality-assuring officials. They know the customers and product in and out, so their perspective is imperative. Similarly, designers are detail oriented and user-centered creative beings. Driving product decisions through them will ensure best product features. Well paired innovators have a history of great successes in life. The intersection of these two functions at several nodes is what makes a perfect product. The roadmap: UX and Product Managers can work conjointly towards building an awesome product. 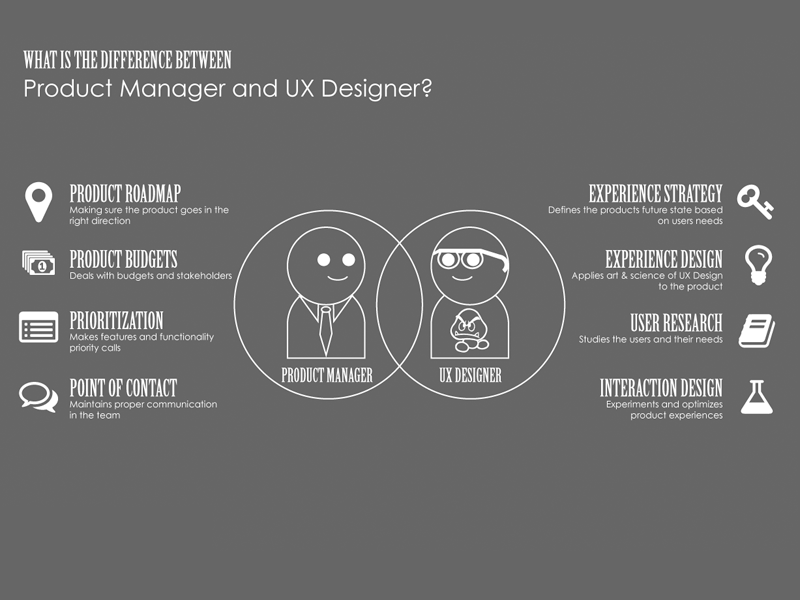 Product managers can lay out the roadmap and develop the UX designer’s understanding of the end-user, targeted industry, the technologies in play etc. Thus the UX designer will help mold the product to meet user’s objectives. Two-in-a-box: Discussion is essential. Both the product and design folks need to sit, exchange ideas and reach consensus. A successful product emerges out of successful decisions. Map out your responsibilities well and see where they have blurred lines which essentially means shared responsibilities. Product and Design no longer work in silos on an org chart. Sketch out the intersection: You need to look at your project and honestly assess how decisions are made. Mapping out the individual responsibilities as well as the overlaps will help the team visualize the entire deal clearly. Have a pragmatic approach to problem-solving and you will see how both benefit from each other at the end of the day. So folks, what did we learn here? PM+UX is the success mantra for any company. Both need to complement, understand and work in unison. This is what makes companies great! Want to know more? Venturesity’s thePMfellas’ LearnUps are back with a focus on Product Management partnering with UX to enhance the product lifecycle while meeting business goals and growing as an entity. The event details and registration can be found here.